1) What is the intent of your portfolio? Please select the most appropriate one. 2) What is the major goal for your portfolio? Please select the most appropriate one. 1) Which of the following ranges includes your age? 2) Which of the following ranges best represents your current annual family income (including pensions) before taxes? 3) After deducting any loan or mortgage balances, which one of the following ranges best represents your immediate family's overall net worth? Investors often have distinct phases in their investment plans. The initial phase is savings and growth. During this time an inventory builds up a portfolio toward a future goal. The second phase is typically the use of funds, either for a specific purpose or for income. 1) When do you anticipate using these funds? 2) At the time you need this money, when will you withdraw it? 3) What are your intentions regarding withdrawals and/or contributions to your investments today and over the next five years? 1) Which statement best describes your knowledge of investments? 2) Realizing that there will be downturns in the market, in the event of a significant loss, how long are you prepared to hold your existing investments in anticipation of a recovery in value? 3) Assuming that you are investing $100,000 for the long term, what is the maximum drop in your portfolio's value that you could comfortably tolerate in any given year? 4) Which of the following statements would you feel most correctly describes your investment philosophy? I can not accept any fluctuation in principal I can only accept minimal fluctuations, and prefer to invest in safer, lower-return investments I am willing to tolerate some ups and downs in the value of my investments to achieve overall higher returns in the long run My main interest is high, long-term returns and I am not concerned about short-term decreases in the value of my investments. If you answered the last 3 questions with the first response, you should re-evaluate your need for growth, and carefully consider it in light of your desire for stability. Portfolios with no ups and downs generally have no growth component. If you are sure you cannot tolerate loss (even short term), stop here. Consider using guaranteed investments or short-term options like money market funds. Investment portfolios aimed at providing higher returns tend to have greater swings in value (providing both gains and losses). The more aggressive your portfolios, the more pronounced these swings become, and the more often short-term losses can occur. 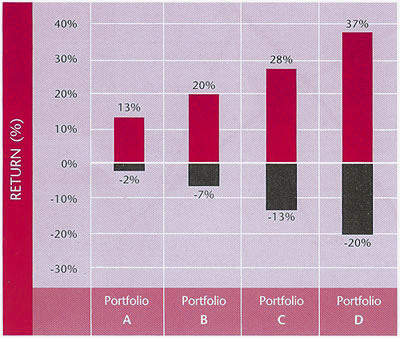 1) A portfolio is a basket of different investments. The returns earned by a specific portfolio depend on the mix of investments that make up the portfolio. The following graph shows the probable range of returns (from best to worst) of four hypothetical portfolios over a nine-year period. In which of these portfolios would you prefer to invest? 2) Some investors are more willing than others to accept periodic declines in the value of the portfolio as a trade-off for potentially higher long-term returns.Which response best represents your feelings toward the following statement? I am willing to experience potentially large and frequent declines in the value of any investment if it will increase the likelihood of achieving higher long-term returns.